Okay, hands up who doesn’t love ice cream? Even though my diet is largely dairy free I still indulge here and there, with the emphasis on “indulge” as I see it as one hell of a reward for making it to the end of the average week! I recently heard about a new service from ice cream maestros Mövenpick that sees the good stuff delivered straight to your door and – with Valentine’s Day top of mind – to the doors of your favourite people too. 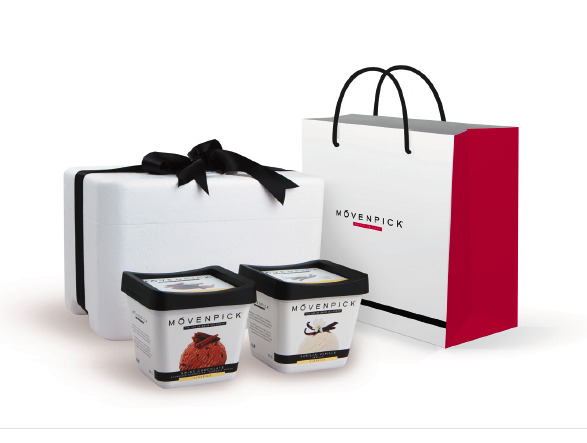 Better than a box of mouldy chocolates or an overpriced bouquet of freeze dried roses any day in my humble opinion, the Mövenpick Special Delivery service comes in the form of two luxurious tubs of goodness from the Swiss ice cream connoisseurs. Guaranteed to “cheer up, congratulate or console”, it contains two Mövenpick 900ml tubs, available in a number of flavours including Caramelita, Maple-Walnut, Swiss Chocolate, Strawberry, Stracciatella and Vanilla Dream. The ice cream is kept frozen in an insulated polystyrene box using dry ice and arrives on the same day as ordered (provided orders are in by 10am). The tubs are presented in a beautiful gift bag, complete with a personalised note so the creamy treat can arrive with a little extra words of love. Diane Foreman, chairman of Emerald Foods (NZ Mövenpick distributor), came up with the idea of this unique service after realizing the amount of flowers they sent each year – and how “same-same” this gesture had become. “I can’t think of a better way to cheer someone up, or say ‘thank you’, than with a couple of tubs of Mövenpick,” she reckons, and let’s face it – ice cream is always appropriate! To organise your Mövenpick special delivery - $49.00 including delivery anywhere in Auckland - go to www.movenpick.co.nz/shop.